October 31, 2014 – At 12:03 the Schuylkill Haven Rapid Intervention Team was dispatched to 6369 Old Route 22, Berks County for a structure fire. As Engine 732 and Squad 739 became en-route Berks deputy Chief 50 arrived on location and found a minor issue with a pellet stove. All Schuylkill Haven units were then placed available. Duty Chief 723 (Reed) also responded as part of the assignment. October 29, 2014 -At 10:29 Station 1 was dispatched for Ladder 725 to 685 State Street, Hamburg Borough (Berks County) for a structure fire with possible entrapment. As Rescue 727 and Squad 726 became en-route, units on the fire ground advised that the bulk of the fire was knocked down and requested all units to reduce their rate. Chief 723 responded as the duty Chief. October 29, 2014 – At 07:48 Station 1 was dispatched along with Fire District 34 to the intersection of Route 183 and 433 (Long Run Road) for a vehicle accident with entrapment. SCCC advised of a two car accident, with one patient possibly needing a door popped. Chief 723 arrived on scene and was able to access the patient by using an adjacent door. Rescue 727 and Squad 726 assisted District 34 units with securing the utilities and fluids. Chief 723 (Reed) had command. October 22, 2014 -At 07:26 Stations 1 & 2 and Chief 735 were dispatched to Broadway Street, (the Island) to setup a landing zone for incoming Medevac 7. PD was the first to arrive on scene and advised Chief 735 (Snyder) that the LZ area was saturated. SCCC then redirected the landing zone to 9A Earl Stoyer Drive, the Grace Evangelical Church parking lot. Crews arrived on scene and established a secure area for “the bird” to land. Due to weather conditions Medevac 7 had to abort the flight. All units were placed available by Chief 735. October 16, 2014 – At 06:38 the Schuylkill Haven Fire Department was dispatched to 401 University Drive for an activated fire alarm. Fire personnel arrived on scene and found no problems with the alarm. All units were placed available. October 15, 2014 – At 23:45 the Stations 1 &2 were dispatched to the area of Berne Drive and Schuylkill Mountain roads for a tree down. Chief 720 arrived in the area and confirmed a tree down on wires blocking a single lane of traffic. Crews Engine 737 and E732 removed the tree from the roadway. All units were then placed clear and available. 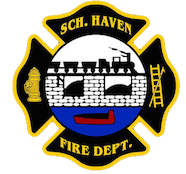 October 8th-10th, 2014 – To kick off fire prevention month Schuylkill Haven Fire Department members conducted a fire safety programs for the students at the Schuylkill Haven Middle School and Elementary school this past week. Students were informed about the dangers of fire and what do to do in case of fire related emergencies. Members also demonstrated and showed numerous pieces of equipment. The students then got a chance to view apparatus and equipment on display by the departments three companies: Rainbow, Schuylkill and Liberty. October is fire prevention month. The Schuylkill Haven Fire Department reminds everyone to change the batteries in your smoke alarms and practice safe escape routes with your family.